Blog – Page 3 – Where Kentucky's Greatest Pro Football Players Live!!! TUSCALOOSA — The questions were inevitable. Alabama signed the top recruiting class for the 2015 cycle Wednesday, according to 247Sports and ESPN.com rankings, but one particular member in the class was a big topic of discussion during Nick Saban’s afternoon news conference – Jonathan Taylor. He arrives at Alabama having been dismissed from the University of Georgia this past July. According to the Atlanta Journal-Constitution, the dismissal came after Taylor was arrested on a charge of aggravated assault/family violence. A University of Georgia police department report alleged Taylor used his hands to choke and hit his girlfriend. After Saban delivered his opening statement in which he thank everyone involved, detailed how the Tide addressed needs and once again took a shot at recruiting rankings, it was time for the coach to take questions. The first question posed was why Saban would sign a player with pending domestic violence charges for allegedly hitting and choking a woman. “We recruited this young man out of high school, and we felt that from what we knew about him, what his high school coach said, what the people at the school that he was at said about him, and where he came from in junior college, that he was the kind of guy that deserved a second chance,” Saban said. “But with that chance, we also have stipulations of things that he needs to do from a personal development standpoint so that he won’t make any kind of mistake like this ever again. But Taylor essentially received a “second chance” from Georgia, as the domestic violence charge was his second arrest in 2014. In March, Taylor was one of four Georgia football players charged with theft by deception after they were caught double-cashing meal reimbursement checks, according to the AJC. Taylor was granted pretrial diversion on those charges, but his second arrest violated those terms, according to the AJC. 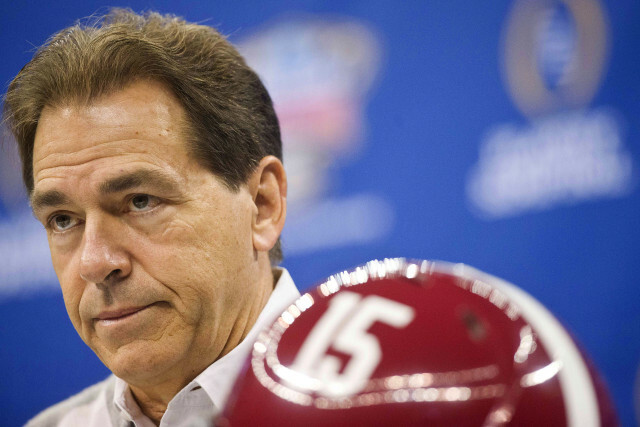 Saban said Alabama doesn’t condone any type of disrespect or violence, especially toward women. Alabama, like other college programs, brings in speakers to educate players on domestic violence and other issues. TUSCALOOSA, AL—Having traversed such unforgiving but target-rich environments as the Texas hill country and the swamplands of the Deep South, University of Alabama head football coach Nick Saban finally returned Wednesday from a two-year recruiting expedition with 94 blue-chip players, sources confirmed. 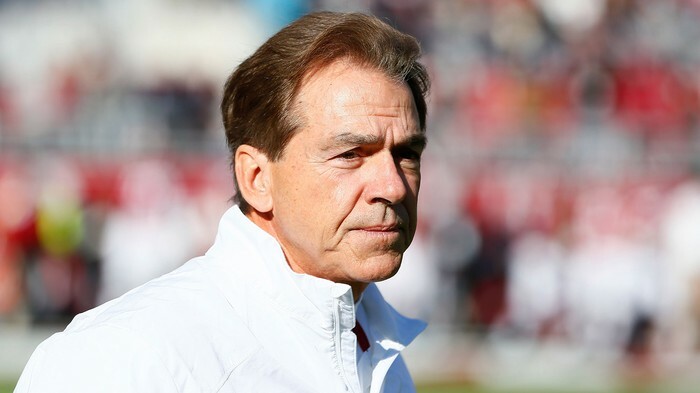 “I spent months patiently tracking some of these All-Americans, but in the end it was worth it,” said Saban, describing the grueling 12,000-mile trek that saw him score such rare and prized prospects as a 350-pound defensive tackle and 13 wide receivers with 4.3 40 times. “It’s all about setting the bait by flashing the national championship rings and promises about playing time, and then you just have to sit and wait. I could’ve easily picked off another dozen three-stars, but honestly I wouldn’t have had room in my pickup for all of them. It was tough being away from my family for so long, although when it was all said and done, this really was the recruiting trip of a lifetime.” Saban declined to comment, however, on allegations that he was caught on Auburn University’s grounds attempting to poach players eligible for a fifth-year transfer. Jacob Tamme first learned about the Kentucky Pro Football Hall of Fame a few years ago when he went to an induction ceremony with his wife, Allison. “It was a first-class event,” said Tamme. However, the former Boyle County High School and University of Kentucky standout never thought then about one day being in the Hall of Fame. Now he is, though, as Tamme along with Doug Buffone from the University of Louisville, the late Gil Mains from Murray State and Aaron Jones from Eastern Kentucky are in the 2015 induction class to be honored June 26 at the Brown Theater in Louisville. Tamme just finished his seventh pro season and is now a free agent. He’s played in Super Bowls both with the Indianapolis Colts and Denver Broncos. He left UK with the most catches by a tight end in school history with 133 for 1,417 yards and 11 touchdowns from 2004-07. In seven NFL seasons, Tamme has 178 receptions for 1,703 yards and 10 touchdowns. He’s lost just one fumble in his career. 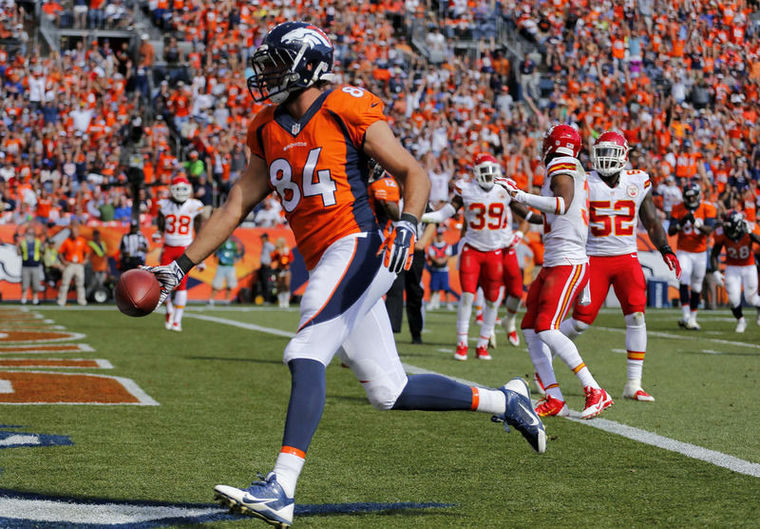 Tamme had 14 receptions for 108 yards and two scores for Denver this season. The Broncos won the AFC West but lost to Indianapolis 24-13 in the playoffs to end their Super Bowl bid.“This is the time of year that everyone wants to still be playing,” Tamme said, who has returned to Boyle County with his family. “I have been blessed to be part of two Super Bowls and would love another shot. But at the end of the day, only one of 32 teams ends up happy. A lot of other teams and players are going through the same things. You put a lot of time and energy into the season, so to have this honor awarded to me now is very special and gives me a positive football moment that is hard to find at this time of year. He admits it’s hard to believe his eighth season will be coming up. He’ll officially become a free agent in early March and a few days later NFL teams can start contacting players and/or their agents. He hopes his experience and versatility — he has been a special teams standout and has played both tight end and slot receiver — helps make him attractive to other teams. “I just hope people respect the way I play and go about playing the game,” he said. “You never know exactly how other teams perceive you and that’s not something I spend time thinking about. But the last time I went through this it was interesting to find out what the perceptions were. However, there’s no real timeline for his. You just have to way for things to shake out. Tamme normally spends this time of year in Danville and also tries to take a few family vacations. He’s keeping his workout location a secret, but says he loves being home with family and friends. Tamme, who went to the Boyle-Lincoln County basketball games Friday, has also bought a farm here.